The lucky few who hear “You’re hired!” get an opportunity of a lifetime to work with the larger-than-life mogul and personality who heads The Trump Organization, a conglomerate that owns and operates hotels, resorts, office buildings, golf courses and residential towers across the world. Greenblatt also has more specific career advice for YU students wishing to pursue a legal career. “Similar to the guidance Donald gives others, my advice is to first make sure—before you worry about the market—that you love and are passionate about a law career,” he said. “If you settle for something less, I think Donald is also correct when he says you likely won’t be as good at what you do. 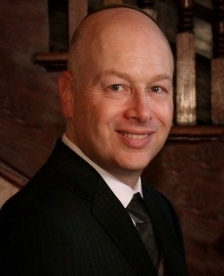 Greenblatt lives in Teaneck with his family, of whom he is extremely proud: his wife, Naomi, a psychiatrist who specializes in women’s mental health, and their six children: Noah, Julia, and Anna, 13-year old triplets, Sophia, 9, Avery, 6, and Vera, 15 months. In advance of their b’nai mitzvah, the triplets, along with two of their younger siblings, formed their own organization, Triplets for a Cause, in which they undertake various chesed [deeds of kindness] projects. They attributed their recognition of the importance of giving to others from their parents, and indeed, despite Greenblatt’s long work days, he makes time to participate in communal activities.